I recall fondly the games my parents and I used to play when we were younger — such as our very own "Salmon says" (derived from the old-school game of "Simon says"). This game was created in a bid to get me to try eating salmon, a fish that's popular for its smooth texture, intense flavours and abundant omega-3 fatty acids. This may sound fishy (no pun intended), but believe it or not, I actually detested salmon back then. How things have changed! 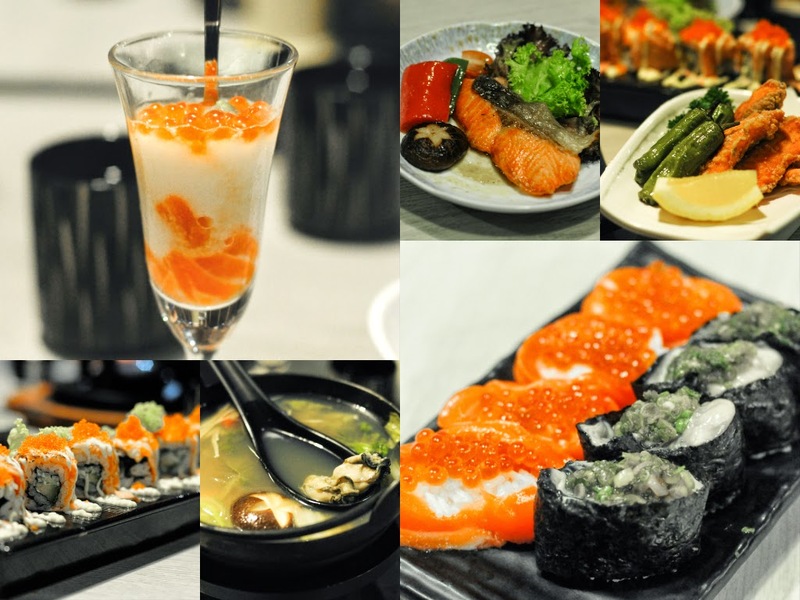 Memories aside, here's the widely-loved fish in 6 mouthwatering forms at Kinsa Sushi! Not all human beings love salmon (myself being one of them some years back) — and this means I could get my hands on larger portions, heh heh! The texture of the roe is smooth and light on the palate. A little wasabi goes a long way in enhancing the delicate flavours of the roe! I was surprised to receive this in a Pilsner shot glass — simply alter the preparation of the salmon and it can be enjoyed as an appetizer or dessert instead of a main. I would recommend that you try this unique concoction before you start on your main. I guess the saying is true — cook anything with butter and it is sure to taste great. The fresh salmon remained soft, juicy and flavourful — a standard not always easily achieved. This looks like an ideal source of protein for avid fitness buffs! If you like potato chips, this could be a healthier alternative for you. Crispy and piquant, these deep fried salmon chunks are perked up with an added zing from the accompanying lemon. The batter is consistent and does not overwhelm the fish. The Salmon and Vegetable Hot Pot gave off a really homely and cozy vibe. The use of chopped carrots, enoki mushroom and cabbage made the bowl of piping hot soup flavourful and simply gratifying! Did you know that Kinsa Sushi brings in exotic aquatic selections 2 to 3 times weekly to ensure quality and freshness? Their ‘3-day rule' ensures that their seafood is not sold as sashimi more than 3 days after they are caught. Salmon aside, Kinsa Sushi is offering a promotion on all fresh oysters for Mother's Day! The Mother's Day AND Father's Day Menu will be available from 10 May - 30 June 2015. Please call to make a reservation if you intend to try this special menu. Classroom management is really a tough challenge for the teachers. Teachers must have control, keep discipline and also motivate the students for this schools union should conduct seminar and workshops for the teachers to train them and custom essays are there to help. However occasionally there's an urgent situation as well as you have to borrow cash; although a little quantity, in order to wave a person more than till the following pay day. It is simple to come back the actual authorized cash inside period of time of just one in order to 15 times according to your individual responsibilities. Therefore, you should obvious your own credit history through blemished information prior to obtaining these types of financial situation. Wow, salmon is my favourite fish. It always tastes so good. We can make various dishes with this fish. Order unique custom essays online.